NO SALES TAX outside the state of Michigan. 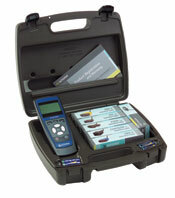 EZ-SCAN 5100 SPANISH: Ideal for the Spanish speaking mechanic who works in the U.S. The next generation of automotive scanners have arrived. The AutoXray EZ-Scan 5100 is an OBD I and OBD II scanner which includes all OBD II protocols, including the newly released Controller Area Network (CAN) protocol, allowing for more capability and flexibility to manage the diagnostic process. The CAN protocol is currently being used in a variety of vehicles and will be the mandated protocol in all new vehicles by 2008. Staying current with the very latest in automotive scanning doesn't have to be a complex effort. The CAN-compliant EZ-Scan makes keeping up with the latest a simple matter. Just turn to AutoXray, of course.